Today I was up in Italian Harlem doing some shopping at the Target (and avoiding the mess down in lower Manhattan). As I was walking back to the bus to get home, I noticed that someone had shut down one of the streets and there were all these people in yellow shirts milling around. I was intrigued and went up there. It was at 118th Street and Pleasant Avenue and they had shut down that block and two lanes of 117th Street (for parking). What I saw was something that I didn’t think I’d ever see: a game of stickball. I’ve heard of it and have even noticed that some street up in Harlem called something like “Stickball Hall of Fame Street” or other honorific. But an actual game being played? I thought that was as likely as seeing an ice wagon drawn by a horse. There were maybe 60 people watching and playing stickball. 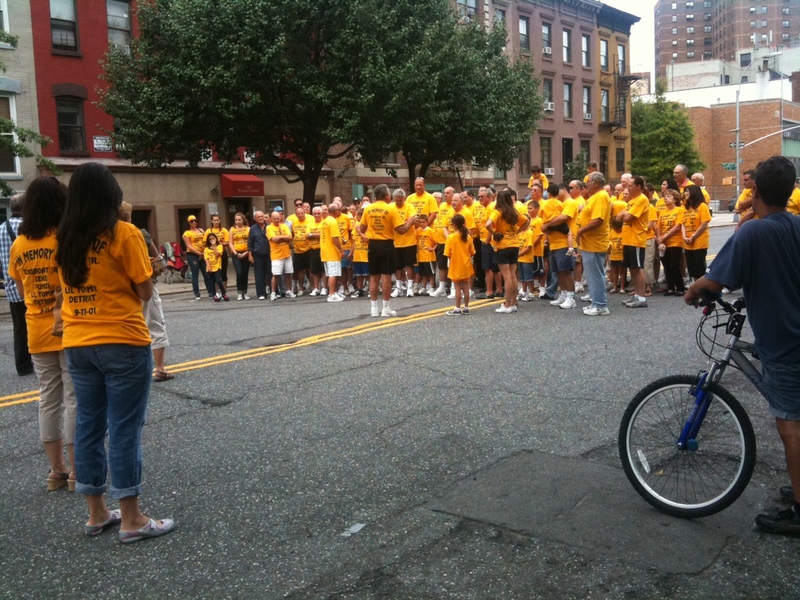 The dress code was a yellow shirt proclaiming a memorial stickball game. For a while I thought it was the most bizarre and wonderful 9/11 commemoration imaginable. A welcome respite from the politics going on several miles to the south. I watched it for a while and missed out on photographs (I no longer carry my good camera, but did have my iPhone). However, I was giving a play-by-play announcement of the game with my cousin and the game ended before I knew it. At the end of it, the participants (ranging in age from about 7 to about 70) gathered for a photo opportunity. They also played the national anthem and “God Bless America”. Like I said, I thought it was a terrific memorial. The shirts themselves listed some names such as “Tugboat Jr.”, Zeke, Funzi, and Tommy; stating “In memory of”. I presumed that these were Pleasant Ave residents/family that had perished in 9/11. Well, I was wrong. It was just a coincidence. I didn’t read the shirts completely. 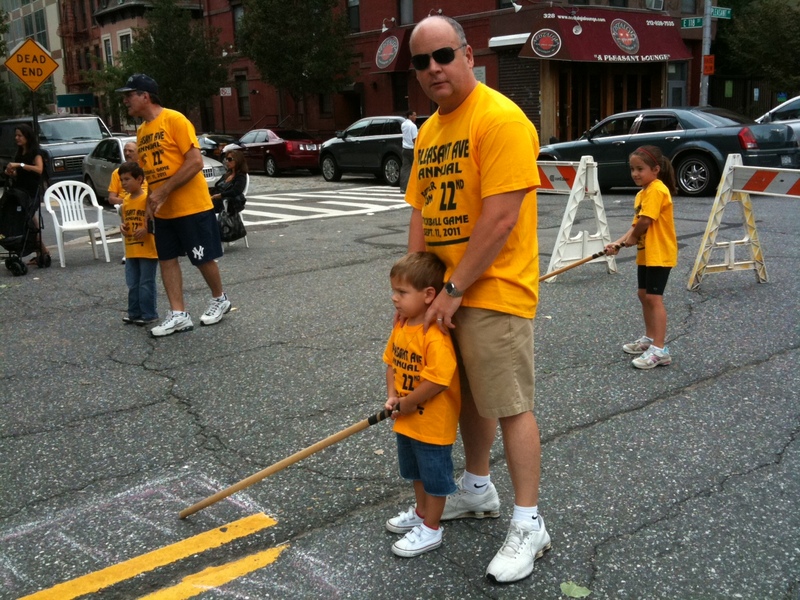 It was the 22nd father and son stickball game. It is held on the second Sunday in September; so it was just a coincidence. Apparently, they did add on some of the music as a secondary salute to 9/11; so I wasn’t completely wrong. What the heck, I’ll just re-write their intentions and say that the pleasant folks on Pleasant Avenue had this long-planned counter-memorial to southern Manhattan’s formality and were celebrating the strengths that got New York through those dark days in 2001. The above picture was during the singing of “God Bless America”. In the picture below, I got a father and son picture showing what the bat looks like. They had a couple of different bats. This one looked almost like a “professional” stickball bat. I did see one that was almost certainly a broomstick without the bristles. The ball? A pink rubber ball. And now the important stuff: how is the game played? The rules looked pretty fluid. Two teams. A bunch of guys (10, 15?) go out and play defense by standing pretty much whereever they want. At least one guy is at first base. Yeah, there’s a first, second, and third base. The batter takes the rubber ball and drops it and hits it after the bounce. He can actually be doing something of a forward run while doing it. A caught fly ball is an out. The batter can the tagged or thrown out. It doesn’t look like there are foul lines, but the buildings act as an interesting way to bounce the ball around. I didn’t see how many outs there were. Nor how many innings. It really had the flavor of a father-son game. Well, there was one young lady so I guess it was father-son-daughter game. And it looked like a very good time. I’m really glad I didn’t have any frozen/perishables in my groceries so I was able to spend a little while there with no pressure to hurry out. You are currently browsing the Famous Ankles weblog archives for September 2011. Famous Ankles syndicates its weblog posts and Comments using a technology called RSS (Real Simple Syndication). You can use a service like Bloglines to get notified when there are new posts to this weblog.